Badal’s (Sanjeev Kumar) mother asks him to present an important amulet to the Maharaja. Puzzled but dutiful, he sets off to meet the king, only to witness his murder at the hands of a royal minister. Unable to either denounce the minister or keep quiet, Badal writes revolutionary poetry under a pen name. Will people heed the poet? Will the minister find out the person behind the verses? 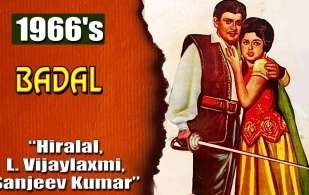 Sanjeev Kumar as Baadal. He is such a delight: handsome, very physical as he springs about, and—of course—a fine actor. This film, while pretty akin to one of those many Dara Singh starrers of the 1960s, is several notches above those simply because of Sanjeev Kumar. Dara Singh I find cute in a blustering, macho Punjabi way, but Sanjeev Kumar makes for a far more attractive hero.